Hundreds of runners will descend on Arran this weekend for the second Ultra Tour of Arran. 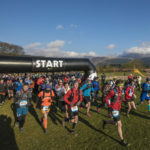 Rat Race Adventure Sports will again stage the audacious 100km off-road running challenge today (Saturday) and tomorrow and with entries up 50 per cent on last year it should be a super event. A quarter of the entrants are woman. All the entrants are all signed up for the two days this year with runners from outside the UK coming from Denmark, Netherlands, Dubai, Germany, France, USA, Canada and Belgium. The two day, fully supported and waymarked, off-road adventure run, packing a hefty 100km ultra distance route around the island with an overall vertical gain of 10,679 feet. Both days start from the green at Brodick beach. Saturday at 8.30am and Sunday at 7.30am and it is quite a sight to see all the runners heading off. On day one the entrants head south (between four and eight hours of running) is characterised by quiet paths, forest trails, some boardwalk sections, some tarmac sections through villages and a lot of forest dirt roads. Day two they head north (between six and 12 hours of running) is virtually all off-road with some serious mountain sections (there might even be snow on the hilltops), where the going is decidedly rough underfoot. There will be several scheduled pit stops interspersed on the route each day, for that much needed quick rest and refuel. 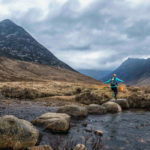 Jim Mee, MD of Rat Race Adventure Sports, said: ‘We are very pleased to be returning to Arran in 2019. The island has so much to offer our Rat Racers and their supporters over and above the huge variety of running terrain from north to south. It has its own whisky distillery, brewery, craft gin, artisan cheese, aromatics, quality local food and drink together with that incredibly special island hospitality. As with all of their events, to ensure runners, their families and friends have the best weekend possible Rat Race will operate from a central Basecamp, for UTA located in at Ormidale Park in Brodick where good food and drink, great amenities, friendly and hospitable staff and Saturday night entertainment.